Alternating sorties of dive-bombers ahead of and on Pearl Harbor Day (Dec. 7) were reflecting how repeated attacks occur regardless of crowd tendencies to try to hand-hold or somehow psychologically buttress investors, with calls for stability and new growth phases. That's not what's likely to happen yet. 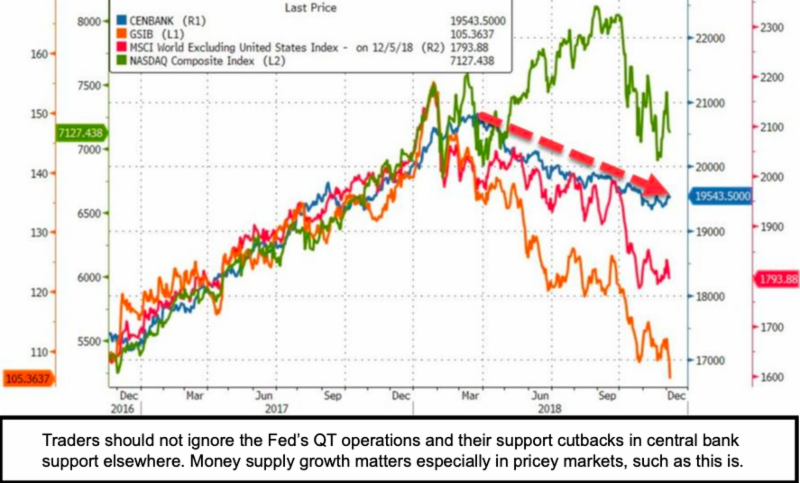 It is not that trade 'alone' has derailed the market; nor was it 'just' the Fed. A general exhaustion of upside occurred 10 months ago; and culminated with the parabolic thrust we often refer to (our first 'crash alert was late January). But my point is not that China needs to pound the table; nor does Japan of course need to buy more Treasuries (they have a lot). And if I had to note a sidebar sort of influence of the market; it might be FOX's Tucker Carlson's blast of President Trump's competence in a Swiss magazine interview. It's not the first time Carlson hit on the President's 'pomposity'; but this went lots deeper and while financial media generally ignored it; I think it took a bite. In terms of bites, we have Paul Manafort & Michael Cohen; details pending; but the market is increasingly aware those are.. on the docket. It was rotational action by that narrow universe of stocks 'artificially' masking ongoing rotational distribution; finally succumbing to the Oct. 2 'crash alert (at the ridiculous high close of the DJIA and S&P); and that related more to competitive awakening (and absence of buy programs to artificially inflate a lot of earnings 'impressions' that often occurred without rising revenue); as of course did tie-into trade (and is why the market sees fleeting relief on talk of a trade deal; though one is not at hand yet; and won't be for awhile). 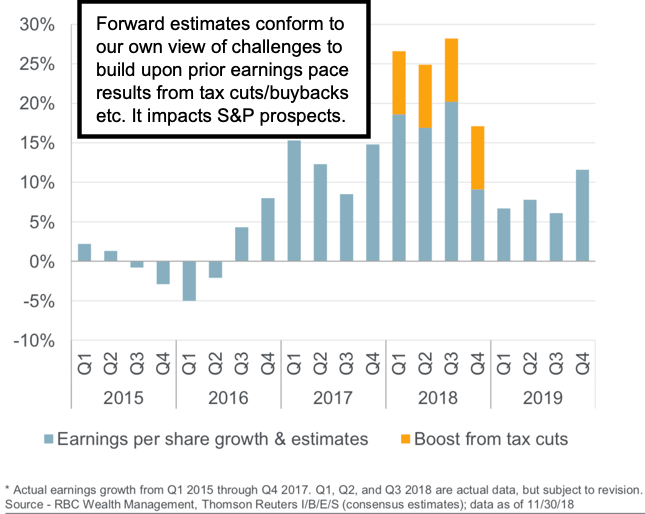 The markets are pricing in deceleration of earnings (already underway) and an uncertainty about 'trade', which would of course help matters. Markets in addition are concerned about a number of issues which pundits generally of course avoid addressing. The political turbulence of the past two years has not impacted volatility very much; but as mentioned recently; don't take any solace in that. It won't be today's sentencing recommendation regarding the Presidential Attorney Michael Cohen, or Manafort; but a new Congress that will promulgate upheaval and perhaps whatever Mueller comes up with. I'm expressing no opinion on that; I simply think the market's a bit more wary.